After Doha I headed to Dubai, and this time I stayed for two nights at the Sofitel Dubai Jumeirah Beach Hotel. During my last visit to Dubai I was at the JA Ocean View Hotel, and it was then that I discovered the charms of the Jumeirah Beach Residence (JBR) ‘Walk’ with its cosmopolitan mix of restaurants and shops. 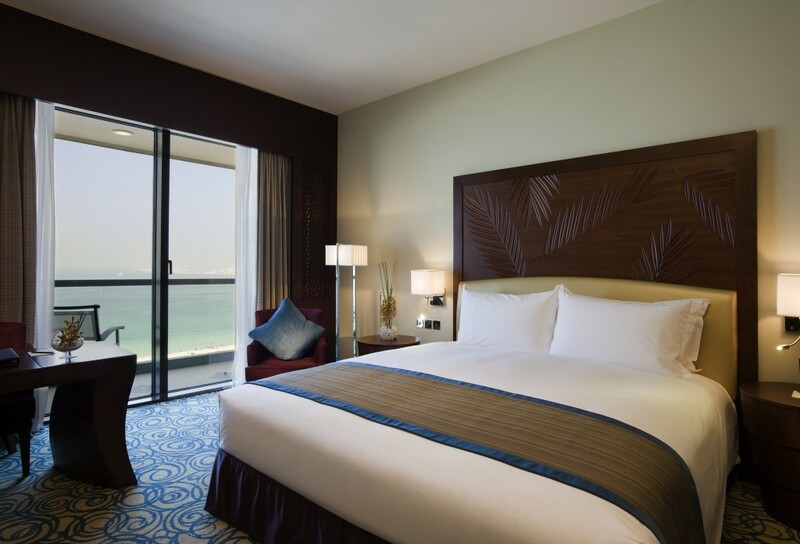 The Sofitel Dubai Jumeirah Beach Hotel is similarly located on The ‘Walk’, and its location in Dubai Marina means that it is within easy reach of the Dubai’s new business hubs: Dubai Media City, Dubai Internet City and Jebel Ali Free Zone. Although not directly on the beach, the property was within a short walking distance to the beach. Each room offered beachfront views (*) as they all had a private balcony, perfect for enjoying the sunset in the intimacy of your own room. 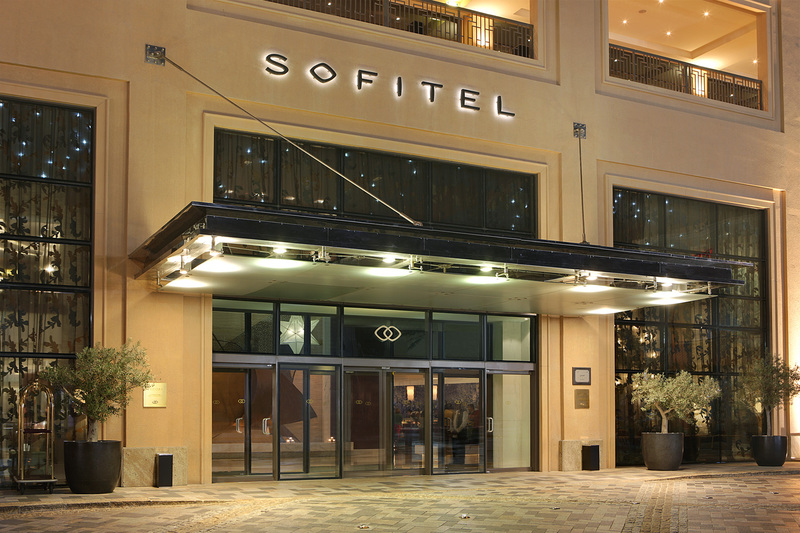 The rooms were subtly decorated in an understated elegance and included Sofitel’s trademark ‘MyBed’, a magnificent wide bed with an overlay mattress, an extra light down duvet, fine Egyptian cotton sheets and a pillow menu that allowed you to simply ‘sink’ in comfort. The bed was truly incredible and made for a great night’s sleep. The bathroom was modern and contemporary in design, although the separate toilet compartment in my room was a little small. Located on the third floor of the hotel, the pool area was another great spot from which to check out the sunset, especially from the infinity pool itself. The pool area also has lounge seating and offers a selection of hot eats, drinks and shishas. The pool area is rather compact, so on a busy Friday afternoon its best to head to the pool early to ensure you get a spot. 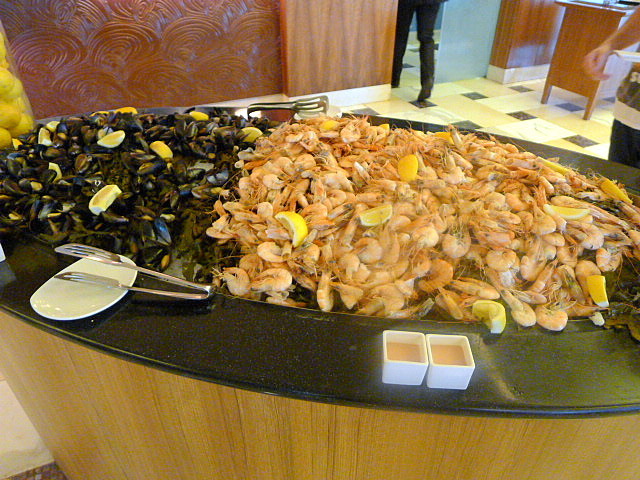 Sofitel Dubai Jumeirah Beach Hotel has a number of dining including Rococo, an Italian restaurant. But our first night into Dubai saw us arriving late at hotel, well past midnight. At such a late hour we were able to find something to eat at the hotel’s 24-hour restaurant, The Plantation Lounge & Bar. The interior was decorated in a colonial style, but there’s also an alfresco area as well. Around this time of year the evening temperatures were mild in Dubai and eating outdoors was particularly pleasant. The Plantation Lounge served a range of light bites as well as a French-inspired a la carte menu. 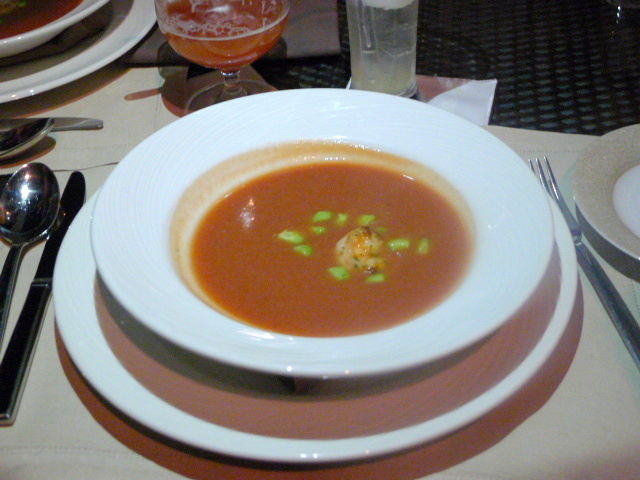 We started with a wonderful gazpacho soup topped with a Gulf prawn (AED40 – about £6.80) which was delicious for the richness of its tomato flavour. It also had a hint of chilli to it which gave it a nice kick, and the shrimp was delicious although a little too cold. 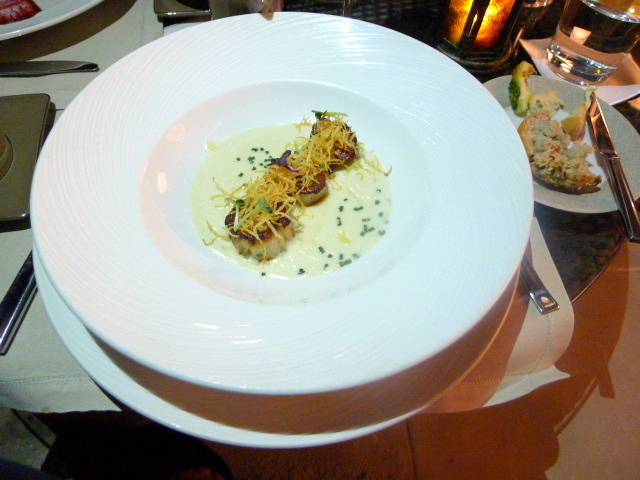 Scallops with vichyssoise and black truffle oil (AED70 – about £11.90) was wonderful. The scallops were well cooked and delicious with a crispy sear to them, and the vichyssoise was creamy and light and showed off great skill, although the taste of the truffle oil was hard to detect. The scallops had been topped with a crunchy deep-fried potato garnish that worked a treat. 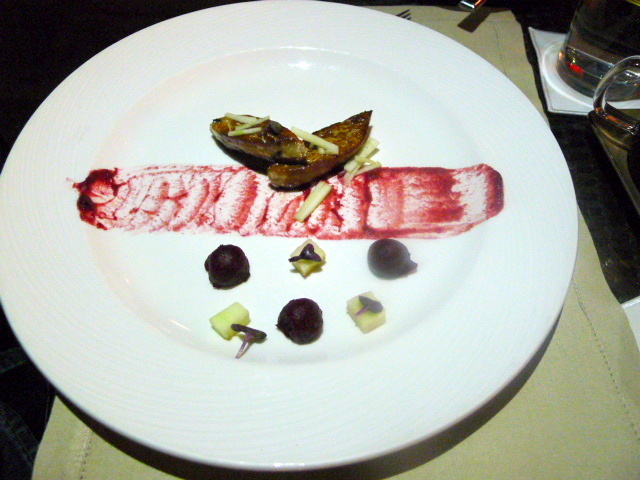 Seared foie gras (AED80 – about £13.60) was also tasty and the accompanying beetroot balls and slices of green apple were pleasant. But as a complete dish, the foie gras needed a little bit more acidity to electrify it. 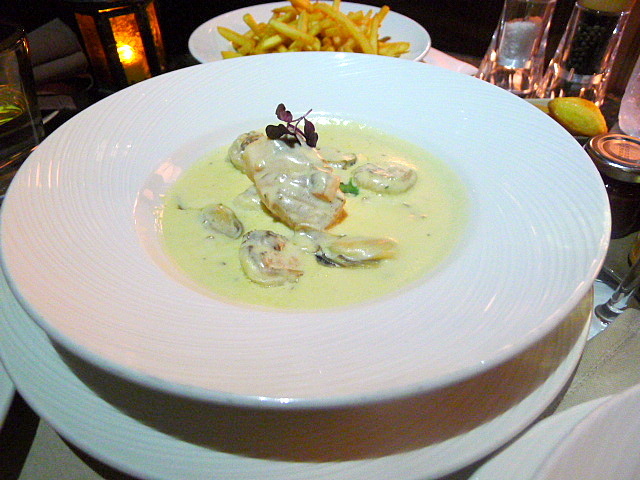 A main of seafood blanquette with salmon, halibut, prawns and mussels (AED170 – about £28.80) was divine. The seafood was nicely done, but it was the creamy white wine sauce, enriched with the lovely flavour of a seafood stock that really made this dish. Desserts didn’t quite hit the high notes however. We ordered a white chocolate with tarragon mousse, blackcurrant compote and lemon praline sable (AED35 – about £6), but it turned out to be a chocolate layered delice of some sort. The waitress assured us there was white chocolate in the dessert, but we neither tasted nor saw anything white. It was all a bit confusing (!! ), but in any event the slice was fairly decent. 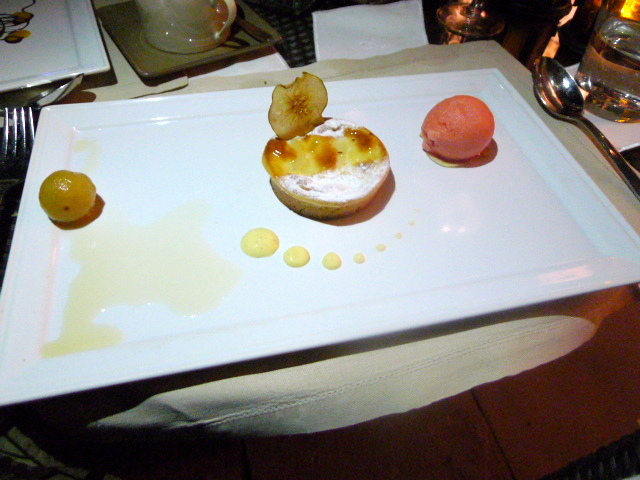 Our second dessert of pear clafoutis with vanilla sauce and grapefruit sorbet (about AED30 – about £5.10) was a real disappointment. It came out almost frozen so was difficult to eat. But if you could get through the coldness of the dessert, the flavour of the clafoutis was actually not too bad. 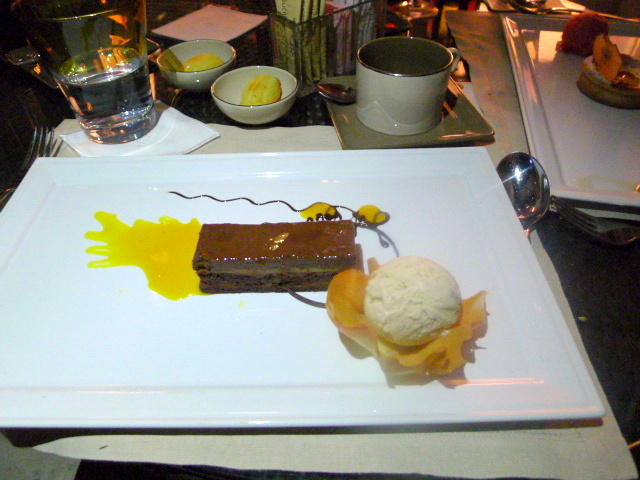 Notwithstanding the desserts, the food was really good in the round, with certain aspects that were really impressive. We also found the service to be pleasant and friendly. That said, the food service itself was rather slow with long breaks in between courses. Mind you, we didn’t sit down to eat until 1am in the morning so that was perhaps understandable. 3) With sparkling wine (AED495 – about £83.80). There was lots of variety in the brunch including mounds of seafood such as oysters, crabs and prawns, and there was also a creative sushi and sashimi selection. The seafood was decent although I found bits of shell in my freshly shucked oysters and the sashimi slices hadn’t been cut properly. For something closer to home there were a range of tasty Arabic mezes, and on top of the cooked dishes there was a carvery section that offered roast beef and roast lamb. This was my favourite as the roast beef was superb. Desserts were in abundance as well but were pretty standard fare in terms of flavour. The drinks service turned out to be quite chaotic. Drinks either didn’t show up on time, and when they did, weren’t the correct order. That said, the waiting staff were all really friendly and lovely. Overall, the brunch was tasty and particularly memorable for its quantity and variety. Breakfast was also served in the AOC Brasserie and there was a really good range of choices. The buffet selection was fairly spread out, so even at busy times you never felt a crush of the crowds. We enjoyed the morning service as there always seemed to be someone to help take your plate to your table once you grabbed what you wanted from the buffet. Food prices are inclusive of tax and service. 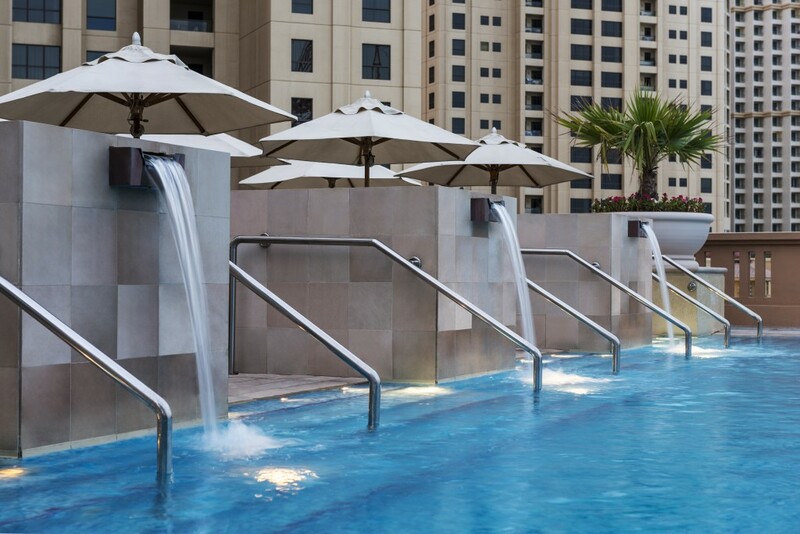 3)	The Sofitel Dubai Jumeirah Beach Hotel’s understated comfort. At The Plantation Lounge: 3 courses range from AED120 to AED315 (about £20 to £53). Brunch prices at AOC were listed above. Prices are inclusive of tax and service, but exclude drinks. (*) There is currently construction taking place on the beachfront area. A new shopping mall is being built, due to be completed by October 2014.